Days of Our Lives spoilers tease that there will be more dysfunction between Ciara Brady (Victoria Konefal) and Claire Brady (Olivia Rose Keegan) when Ciara finds out that Ben Weston (Robert Scott Wilson) and Claire had conspired to break up Ciara and Tripp Dalton (Lucas Adams)! However, there probably won’t be as much dysfunction between Claire and Ciara as there will be between Ciara and Ben; they break up by the end of the week, and Ciara will leave town for awhile to clear her head. According to Days of Our Lives spoilers, she also plans to visit Theo Carver (Kyle Pettis)! Hearing this after finding out Ben kidnapped Gabi Hernandez (Camilla Banus) from the Kirakis mansion for Stefan DiMera (Tyler Christopher) apparently is the straw that breaks the camel’s back! Ciara, however (and her portrayer) will be back in February in time for sweeps! Ciara finds out about the collusion between Claire and Ben after confiding in Claire about her Ben problems. Then Claire calls Ben and reams him out for messing up their plans for herself and Tripp, and Ciara overhears the call! She and Claire just had mended fences when “Grandma” Julie Williams (Susan Seaforth-Hayes) had fallen down the Kiriakis stairs and no one was sure if she would regain consciousness after she slipped into what turned out to be a temporary coma. Claire has had her eye on Tripp for quite a while, while Ben of course has had his eye on Ciara. But as long as Ciara and Tripp were together, Claire couldn’t get anywhere with Tripp, and Ben couldn’t get anywhere with Ciara! 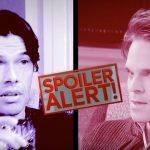 Days of Our Lives spoilers indicate that Ciara will drag the truth out of Claire about she and Ben’s working together to make the breakup happen between Ciara and Tripp, but it appears the two girls will work things out with each other. Stay tuned to Days of Our Lives and check Days of Our Lives spoilers frequently to see what happens here on out!